Already more than half a year since the Galaxy Note first released and has sold more than seven million units worldwide. While Samsung aims to sell the Galaxy Note of 10 million units. With the success of the Galaxy Note, Samsung is reportedly working on its successor, the Galaxy Note 2. 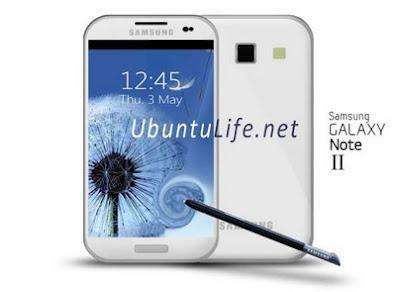 As reported by the site UbuntuLife , technology and features in the Galaxy Note 2 will be similar to the Galaxy S III. There is a S Beam, S Voice, NFC, and other SmartStay. reportedly also GalaxyNote 2 will have a slightly larger screen, which is 5.5 inches with a WSXGA + (1680x1050) and pixel density of 360. Galaxy Note 2 will use the Super AMOLED screen (non-Plus) of PenTile Matrix for more power efficient when compared to the RGB AMOLED Plus. While on the processor, Galaxy Note 2 rumored to use the Exynos 5250. Also embedded 8 megapixel camera resolution is claimed to be better at taking pictures and video.